Specialized stanchion systems need to be able to handle any situation. 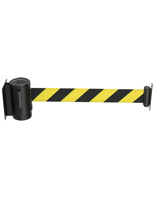 These wall mount retractable belt barriers provide a way to cordon off or direct people with or without the use of stanchions. Their dual-purpose designs feature affordable pricing while maintaining the look and quality of your crowd control setup. 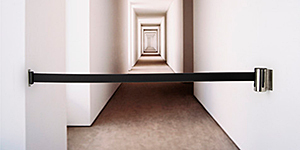 The wall mount retractable belt barriers are available in our QueuePole line only, with a single receiver plate (which is designed for use with Tennsabarrier systems only). The economy QueuePole models look very similar to the replacement belt cartidges that attach to the stanchion posts. The main difference is the wall mount plate. This specialized application extends the reach of your crowd control system. For example, you may have a line of posts connected together that dead-end into a wall. 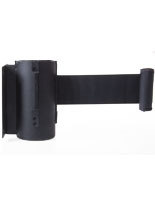 Replace that last post with our wall mount mechanism which provides a finished look while saving you the extra cost. 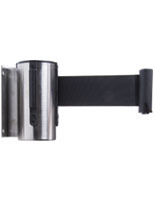 In addition, this wall mount retractable belt system can also be mounted inside halls and doorways (see image at right). Cordon off rooms or entrances simply yet effectively in house museums, galleries, staircases, or any other application where you don't want people to enter. The fact that this wall queue line doesn't require a post makes for a streamlined presentation. 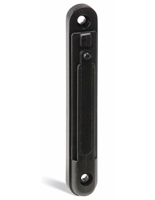 You have your choice of finish on the mechanism, black or stainless steel. 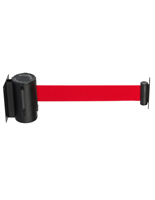 Belt colors are available in red, black, and yellow/black caution stripe.